Wallachia. King Mircea, AD 1386 to 1416. Silver Ducat. Date: early issue, AD 1386 to 1396. Size: 14.4 x 14.9 mm. Weight: 0.32 grams. Grade: VF with typical weak areas. Obverse: Eagle on a helmet with Slavic inscriptions around. Reverse: Shield with Slavic inscriptions around. King Mircea of Wallachia was the Grandfather of Vlad III Tzepesh (the Impaler), also know as Vald Dracula (son of the dragon) on whom the Dracula stories are based. Coins of Vlad III Tzepesh (Dracula) are not known to exist, with the closest to him being those of his father Vlad Dracul (Vlad the dragon) and which are seldom available as there are thought to be less than 25 in existence. 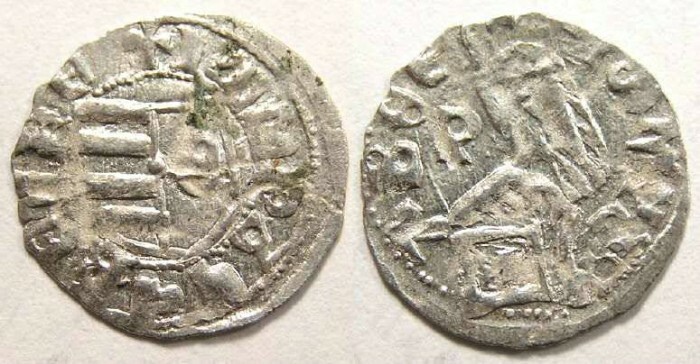 It seems likely these coins of Mircea would have been commonly circulating at that time of Dracula, and certainly are the most affordable coins that might have been used by Dracula.